When I managed to steal some time the other day, I revisited an older project and here is what I whipped up - few Herringbone Weaved Rings. 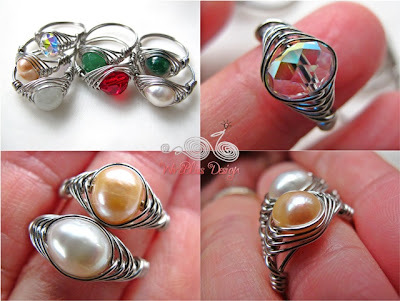 This is one of the techniques I fell in love with when I first started with this wire jewelry addiction. Eni has a free tutorial for it and it should be available at her JL site. Oh...you can't find the free tutorial in this blog anymore. I have since taken it down. However, the tutorial is still available for Free if you purchase this other tutorial - the Caged Herringbone Weaved Bead. Yeah! my own variation to the Herringbone Weave. The pearl HBW rings are quite pretty don't you think so? Note to self - make more of them. Very pretty rings. And very nice work. I've made a couple rings before but haven't tried this weave. Thank you for sharing.